A tomato sauce with a unique taste, thanks to the selection of precious raw ingredients and the tradition. Moringa oleifera, with its complete range of proteins and mineral salts, its high concentration of vitamin A and C and antioxidants, makes this delicious sauce rich of health benefits. 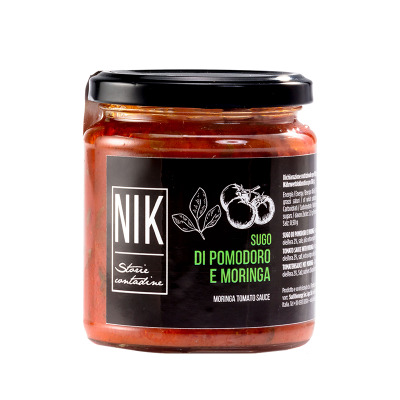 San Marzano tomatoes come from local, certified suppliers; Moringa oleifera is 100% of Italian origin and cultivated in Favella's farm, like all the other aromatic herbs used for cooking; the extra virgin olive oil is obtained from the “Dolce di Rossano” olives, a local variety of olives of the plain of Sibari. The same old recipe is passed down verbally from one generation of women to another and the family large copper saucepan is still in use: the cook in open saucepan for a short time gives the taste of a “just home-made” sauce. The result is the fresh taste of the best tomatoes. 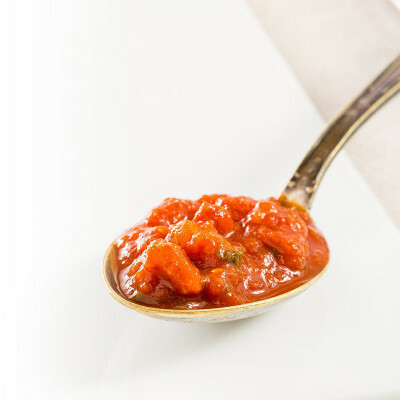 No onion used during the cooking process gives a very delicate and yet tasty tomato sauce, enhancing the slightly spicy taste of the Moringa oleifera leaves. Peeled tomatoes 96%, Moringa oleifera 2%, salt, extra virgin olive oil, garlic. Keep in a cool and dry place, away from extreme sunlight and heat sources. Refrigerate after opening and consume within 7 days. To condiment any kind of pasta or rice. Ideal to prepare meat sauces or to serve with white meat stew. Surprising as a base for “guazzetto”, fish and tomato soup. As aperitif, on bruschetta or hot crostini together with fresh or hard cheese. Delicious as pizza topping.